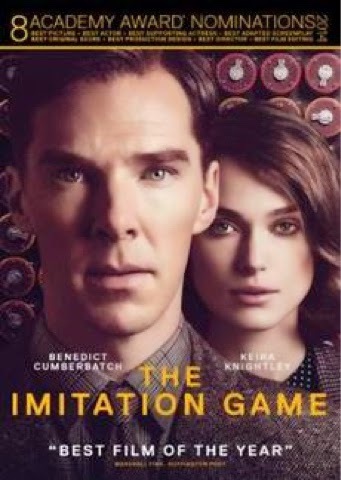 GenreOnline.net: THE IMITATION GAME Available on Blu-ray & DVD March 31st & for Digital Download March 20th. THE IMITATION GAME Available on Blu-ray & DVD March 31st & for Digital Download March 20th. BEVERLY HILLS, CA – Anchor Bay Entertainment and The Weinstein Company are proud to announce the home entertainment release of THE IMITATION GAME, starring Benedict Cumberbatch, Keira Knightley, Matthew Goode, Rory Kinnear, Allen Leech, with Charles Dance, and Mark Strong; written by Graham Moore and directed by Morten Tyldum. Heralded as one of the top films of the year in nearly every major publication, the independently produced film has gone on to gross more than 150 million dollars worldwide, and received eight Academy Award® nominations including Best Picture, five Golden Globe® nominations, nine BAFTA nominations, and three Screen Actors Guild nominations. It won the Academy Award® for Adapted Screenplay, was named one of the Best Films of the Year by AFI, received the USC Libraries Scripter Award and was awarded Best Adapted Screenplay by the WGA. It will be available for digital download on March 20th before heading to DVD and Blu-Ray ™ with Digital HD on March 31, 2015. During the winter of 1952, British authorities entered the home of mathematician, cryptanalyst and war hero Alan Turing (Benedict Cumberbatch) to investigate a reported burglary. They instead ended up arresting Turing himself on charges of “gross indecency” – an accusation that would lead to his devastating conviction for the criminal offense of homosexuality. Little did officials know, they were actually incriminating the pioneer of modern-day computing. Famously leading a motley group of scholars, linguists, chess champions and intelligence officers, he was credited with cracking the so-called unbreakable codes of Germany's World War II Enigma machine. An intense and haunting portrayal of a brilliant, complicated man, THE IMITATION GAME is the story of a genius who under nail-biting pressure helped to shorten the war and, in turn, save thousands of lives. The Weinstein Company (TWC) is a multimedia production and distribution company launched in October 2005 by Bob and Harvey Weinstein, the brothers who founded Miramax Films in 1979. TWC also encompasses Dimension Films, the genre label founded in 1993 by Bob Weinstein. During Harvey and Bob’s tenure at Miramax and TWC, they have received 341 Oscar nominations and won 79 Academy Awards. Since 2005, TWC and Dimension Films have released such films as VICKY CRISTINA BARCELONA; THE READER; INGLOURIOUS BASTERDS; SCRE4M; SPY KIDS: THE KING’S SPEECH; THE IRON LADY; UNDEFEATED; THE ARTIST; THE MASTER; SILVER LININGS PLAYBOOK; DJANGO UNCHAINED; SCARY MOVIE 5; LEE DANIELS' THE BUTLER; PHILOMENA; ST. VINCENT; THE IMITATION GAME; BIG EYES and PADDINGTON. Upcoming releases include WOMAN IN GOLD, SOUTHPAW and UNDERDOGS. TWC boasts an active television production division which garnered nine Emmy nominations in 2013 and five in 2014. TWC Television produces the reality powerhouse Project Runway, with its spin-off series Project Runway All Stars and Under The Gunn. Recent TWC television productions include John Fusco’s Marco Polo, Mob Wives, Million Dollar Shoppers, Rodeo Girls and Trailer Park: Welcome to Myrtle Manor. Scripted projects in development include Ten Commandments and Daniel Stashower’s The Hour Of Peril. TWC also developed Nanny Diaries and produced The No. 1 Ladies' Detective Agency. Anchor Bay Entertainment is a leading home entertainment company. Anchor Bay acquires and distributes feature films, original television programming including STARZ Original series, children's entertainment, anime (Manga Entertainment), fitness (Anchor Bay Fitness), sports, and other filmed entertainment on DVD and Blu-ray™ formats. The company has long term distribution agreements in place for select programming with AMC Networks, RADIUS, and The Weinstein Company. Headquartered in Beverly Hills, CA, Anchor Bay Entertainment has offices in Troy, MI, as well as Canada and Australia. Anchor Bay Entertainment (www.anchorbayentertainment.com) is a Starz (NASDAQ: STRZA, STRZB) business, www.starz.com.